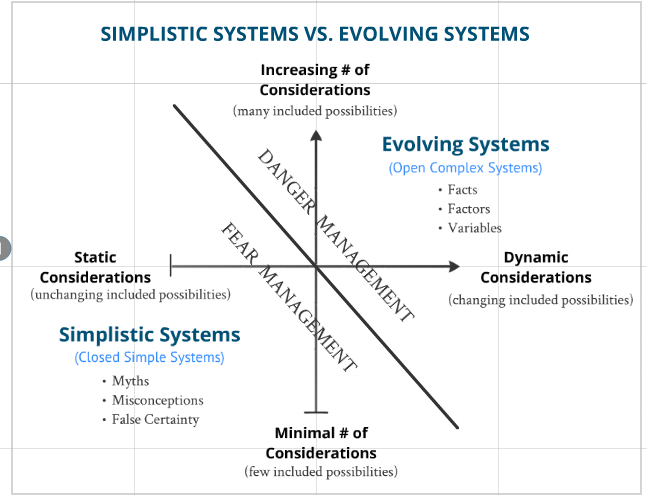 Simplistic Systems and Evolving Systems – Erik Kondo – Conflict Research Group, Intl. All Self-Protection Methodologies are essentially problem solving systems whose solution is to deprive an aggressor of his or her Intent and/or Means and/or Opportunity to do harm. The Point of View of the Problem Solver influences which system he or she will choose. All of these systems are made up of a distinct set of variables (Considerations) that can be divided into Factors, Assumptions, Problems, Outcomes, and Solutions. The Solutions are a subset of the Outcomes. The Outcomes are a subset of the Considerations. The Factors, Assumptions, and Problems are also a subset of the Considerations. Therefore, the Considerations are the variables. There are Closed Systems, Open Systems, Simple Systems, Compound Systems, and Complex Systems. All these systems have their own unique set of considerations. A Closed System has a fixed set of considerations, and thus is not subject to change. An Open System has a varying set of considerations, and thus is constantly evolving and changing. A Simple System has few considerations, and therefore applies to limited situations. A Complex System has many considerations, and thus may be applied in multiple and varied situations. An Evolving System is a Open Complex System. A Simplistic System is a Closed Simple System. The majority of popular self-protection systems are Simplistic Systems. These Simplistic Systems depend on “solving” selected Problems and allow for limited Outcomes. Simplistic Systems are easiest to market and sell because they effectively follow the KISS Principle of Keep it Simple Stupid. They offer a simple solution to a simple problem, and thus they have great emotional appeal. The considerations are ALL of the possibilities allowed for by the system relating to all parties and the environment involved. For example, assume a system that uses a punch to the head as a response to an aggressor’s action and/or attack. The intended solution is the incapacitation the Aggressor which takes away his means to do harm. Do the outcomes include one, a few, some, most, or all of the following? A broken hand by the Defender (puncher). A punch that has minimal effect on the Aggressor. A knocked out Aggressor who then falls, hits his head, and dies. A bystander who only sees the Defender’s punch, and tells the police that the Defender is the Aggressor. A Puncher who cuts his hand on the mouth of the Aggressor and gets a serious infection. A Defender whose hand is already injured so he can’t punch effectively. A pre-emptive punch that terminates the confrontation. A pre-emptive punch that escalates the confrontation. A punch that gets blocked. A punch that misses completely. The Aggressor’s friends get involved after the punch. Small or frail Puncher and large Aggressor. For example, if someone says “Well, if he did THAT to me, I would just punch him in the face.” The person’s problem solving action to the problem of “THAT” is to punch “Him” in the face. This action is designed to create the solution of depriving “Him” of the means and/or intent to cause harm. This person uses a Simplistic System for self-protection. Most likely he will be able to site numerous examples of where his System has been used successfully. If he wants to establish himself as a “badass”, this System will be emotionally appealing. Most likely, he will also reject any evidence or information that suggests his Solution is not the only Outcome. The other Outcomes previously suggested will be dismissed as “unlikely”. Thus, his methodology is a Closed System. When teaching or explaining his System to others, he will only select Problems that are “solved” by a punch. The Outcomes are restricted to those that are compatible with his System. Promoters of his System will have the same emotional attachment to both the image/identity created by the System and the resulting Solution. When promoters of different Simplistic Systems meet, they will declare the superiority of their chosen system and the inferiority of the other system. The result will be a dogmatic battle with both sides citing hand-picked examples as “proof” of their system’s problem solving ability.